Truth be told, earning and spending airline miles is a game of strategy and wits. Airlines are in the business of making money, not dishing favors out. Over time, most frequent flier programs have deteriorated and airlines are no longer as generous as they used to be with mileage points. To come out ahead, you need to tweak your strategy. Keep away from these common and costly mistakes that plague travelers and you’ll live to enjoy your mileage points! This is perhaps the most common mistake you can make. You forget about your airline miles and time expires on your points. Yes, unfortunately airline miles come with expiry dates indicated in the fine print of your policy. Read it carefully. The simple solution is to make a cheap purchase from the online portal of your points program. Most frequent flier programs and airlines have online shopping portals. A purchase will extend the life of your miles. All that is needed in most cases is some activity on your credit or debit card to keep it fresh. Most if not all airlines miles programs allow you to redeem products with your miles. It can be anything from a shiny flat-screen, fridge etc. The problem with these redemptions is that they are bad value for money. You redeem at a ratio of less than 0.1 miles to money spent. The recommended redeem ratio is above 2.5 where you start to get the value of your points. If you can, avoid redeeming your points for merchandise. Instead, aim for other experience redemptions such as hotel stays and upgrades on flights. This is a no-brainer. Record the number of times you eat out in a month whether for business or pleasure. Second, calculate the amount of money you spend on each of your eating out experience. Now, imagine you could earn a point for every dollar you spend eating out! Further, imagine you can redeem the points you accumulate over time to fly free to your favorite travel destination. How easy can that be? All you have to do is link your card to a dining rewards network and eat at participating restaurants. Anything you consume that ends up on your tab automatically earns you point. You can even pay for friends and they refund you back in cash. You earn some extra miles at their expense! Your airline miles are a special kind of “investment”. They don’t appreciate in value over time but they do accumulate. Unlike normal investments though, over-diversifying your points earning programs will only get you hurt. When it comes to earning miles, you need to keep your efforts focused on a few programs. This will quicken the process of achieving elite status. That’s where the real magic happens. Elite status opens up a new world of travel and flight experience. You get to enjoy a plethora of perks in elite status, from preferential treatment on flights to quick and painless travel experiences. Don’t get me wrong. It’s not bad having and participating in a number of programs. Different programs have different ways of earning points that might be beneficial to your spending. Keep these programs to a manageable and profitable level. Most airlines miles programs among them Delta, Hawaii, and Southwest have online shopping portals. These portals allow you to shop at participating outlets and earn bonus points for every purchase you make. If you are shopping online anyway, why not check out products listed on these portals and increase your airline miles from the comfort of your house. It’s a simple and legitimate way to easily accumulate miles but one overlooked by most travelers. Take the time to browse through. Airlines will stonewall you when it comes to redeeming points for a free flight. Free seats on airplanes are expensive real estate. Most times, agents will give you the first choice on their screens when you want to redeem a flight. Don’t settle for that. You can do better by performing a bit of research on participating partner sites for available seats and flights. Arm yourself with this information the next time you call an agent to redeem points. You can get a better placement and get more value for your points through a bit of digging and comparing available options. I have been guilty of this as well. You just like to see the balance of your points increase. You imagine the day you redeem the miles for a trip across the globe. As already pointed, points expire if not utilized. And honestly, the point of accumulating miles is to spend and enjoy them so redeem yours once in a while. Moreover, deals, bonus points and sign-up bonuses come up all the time. You will have ample time and opportunity to accumulate more mileage points. The whole point of airline miles is to earn miles cheaply through any legitimate means. Then, redeem those miles for something worthwhile, something that enriches your life. By avoiding the common mistakes most people make with their airline miles, you are on your way to achieving the airline miles nirvana – where you hit elite status and the floodgates of travel perks open up! What other mistakes have you encountered with your mileage programs and how did you work around them? Weekly Roundup – Five Family Beaches To Visit In US. When it comes to vacations, people tend to choose beaches as the first priority to spend their time. Apart from enjoying the summers’ cool breeze, beaches host a number of activities that you and your family could have a pretty good time together. Family campfire nights, nature walks, surfing and swimming are just a mention of great activities you could be enjoying on your next travel to the beach. However when it comes to family outings, not all beaches could be favorable enough for each family to feel comfortable together. To beat the challenge of finding the best beach to fit your family, I have complied the best places for your family to enjoy the waves and the beach hotels. The Outer Banks is a major tourist destination and is known for its temperate climate and wide expanse of open beachfront. The Cape Hatteras National Seashore has four campgrounds where visitors may camp.Enjoy the great summer weather on OBX. The beach also provides rental condo ideal for your family time and beach access. The beach is located at Hilton Head, South Carolina. The beach offers the best swimming facilities suiting every family member. There are small tidal pools that form during low tides. 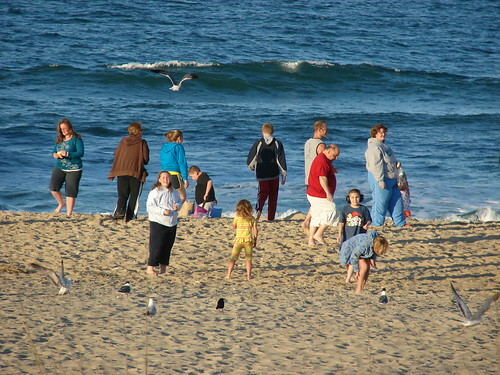 Also they will love hunting for sea shells and other beach treasures. There are plenty of activities like sand biking and entertainment such as magic shows. Just a few steps from Coligny Beach Park, you will find Holiday Inn Oceanfront which organizes free poll and beach side games. The beach is located on the sunny south side of Maui. The is one of the best beaches which is ideal for your family, especially for young kids. It has the largest park, with a beautiful grassy area for relaxing, picnicking and people-watching. There are picnic tables, restrooms and outdoor showers in the parks beside each beach. Each of the three parks has a free parking lot or adjacent free street parking. Kids might spot sea turtles or even puffer fish! This could turn to be the best retreat for your family. The beach offers a budget friendly rental condo.This is more favorable if you had a plan of spending the night there. The beach is located just from the 5 freeway just south of downtown San Diego, through the Coronado Bridge over the bay to Coronado Island. Whether you’re looking for a romantic island getaway with your partner, or a fun-filled family beach vacation for your family, you’ll find the idyllic beach paradise in the “crown city” and its neighboring regions.Enjoy cool breeze and tide pools filled with sea creatures form in front of the famous Hotel del Coronado. The beach provides a parking space and a designated lot for those staying in the hotels. Safety is guaranteed in the beach by availability of lifeguards and the beach patrons. The only resort along this stretch of sand, the Victorian-style Hotel del Coronado offers family s’mores nights, a drop-off kids’ program for 4- to 12-year-olds, and babysitting. Coquina Beach, located on the south end, is the longest stretch of beach on Anna Maria, with plenty of free parking, lifeguards, concessions, picnic tables, a playground, restrooms and showers. Remnants of old piers jutting out into the water (dividing sections of the beach) make it awkward for running, but a choice spot for surfers. It’s also the place where you’ll mostly find younger groups of people gathering around a boom box, sunbathing, or playing Frisbee on the sand. The Tradewinds Resort, just a 1-mile trolley ride from the beach, gives families a seashell guide and loans out buckets, sand tools, and floaties. A great money saver: Each room has a full kitchen. Which beach can you recommend for a family vocation? Please leave your reply in your comment below. 5 of the Best Coffee Shops in Addis Ababa, Ethiopia – migrationology. It’s Not The End Of The World If You Don’t Travel – Wandering Earl. 8 reasons to escape to the Four Seasons Resort Koh Samui – A Luxury Travel Blog. Lenin’s Russia: A Place You Have to Want to Go – Go Nomad. Traveling is enjoyable. Sharing your travel experiences with your family or friends makes it more pleasurable. The biggest challenge for travelers and backpackers is to keep in touch with their loved ones but the modern technology has made it possible to keep in touch in various ways. I would like to talk about popular modern ways to keep in touch with your people irrespective distance or place they are. This is my favorite mode of communication and the most interesting part about emails especially Gmail you can attach and share photos of your travel with your friend, family and fellow bloggers. The only disadvantage without internet you can’t access your email account. Blog is an informal site that consist discrete entries or posts. Whenever you are writing about your travels, uploading that video or posting a picture those at home, friends and your audience see what you are up to, which side of the globe you are hiking or thing you are doing on the other side. This the most used and popular medium in keeping in touch with friends and family. It’s possible to interact with your audience, fellow travel bloggers by creating Facebook group or page. Facebook also offers instant messaging and video call. One of the best medium for communication. All you need is a laptop or a computer and Skype program to call all around the globe. Smart phones do also have Skype program. It is possible to share travel photos with your family and your fellow bloggers. Get this program, sign up a Skype account and get to enjoy calling almost everyone around the globe. This is another medium being used by almost everyone. Its easy to communicate via twitter. Just set up your account and then notify your family and friends. Share your photos or post an update about your where about or even sharing ideas with your fellow travel bloggers. How do you keep in touch with your family and friends? Feel free to share with us in the comments below. Stewards are members of an aircrew employed by airlines primarily to ensure the safety and comfort of passengers aboard commercial flights, on select business jet aircraft and on some military aircraft. With the competition surrounding Airline industry, different airlines are hiring beautiful, charming and well dressed stewardesses to attract customers. The airlines with the best cabin crew may be setting themselves apart. We’ve put this poll together to figure out which airlines with best stewardesses. You are most welcome to vote in the poll and share your experiences in the comments below. Based on things they do, countries they travel and food they eat, you may thinks travelers and backpackers are multimillionaires. The truth is most of them travel smart and frugal. They have ways to make their money last a bit longer while on the road. I hereby share with you tips to save money while traveling around the globe. Traveling popular destinations during off peak will result to high cost being reduced. Not only will you get lesser crowd, but you are guaranteed to get cheap flights and hotels to stay. Take advantage of free days when museums and public galleries are open free to public. Major towns have them and by making use of them you will definitely save a lot. If you want to know the cheapest and best places to visit, then interact and befriend locals. By interacting with them you also get an opportunity to learn their culture. Grab yourself an airline credit card and start racking up airline miles. Take advantage of hotel and booking agencies rewards and make use of them. Looking after someones property while they are away on a trip or vacation will not only be a source of income but an opportunity to travel. Example you are a Canadian house sitting in London, you get that opportunity to explore London. Hostels and guest house are cheap, clean and friendly. Travelers should take use of hostels and guest house to save money that can be used elsewhere while traveling. Traveling from one point to another by use of public means is always cheap as compared to hiring a tax or a vehicle. So, ditch that taxi or cab and take a bus, a train, ride a bike or explore your destination on foot. Making your own food is cheap compared to eating in a restaurant or a hotel. This can be better be applied in those expensive cities like Paris, London. Negotiate for a cheap rate in those hotels and transportation. Negotiate with that local selling clothes or other touristy item in the market. Try to buy thing in bulk so to make that room for negotiation. Make your own ways to local attractions for a little price. It is advantageous cause you will enjoy the place longer and at your own pace.